A perfect and delicious post workout treat. This cake is perfect for body builders, high in protein, sugar free, low fat, high in fiber . In a food processor mix all the ingredients except the chocolate chips and quest bar. After the mixture become uniform brush small pan for mug cake. 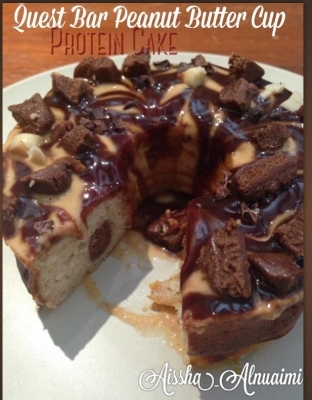 Cut the quest bar in small pieces and add inside the cake and the 2 spoon of chocolate chip. Keep few piece of quest bar for topping. Bake for about 20 min at 250 C and top with Pb2 (peanut butter) and organic dark chocolate. Them sprinkle with cacao nibs and pieces of quest bar..